You all know by now how much I love soups, especially on a cold rainy day. A couple of bowls of soup for lunch and dinner, I’ll be one happy person. 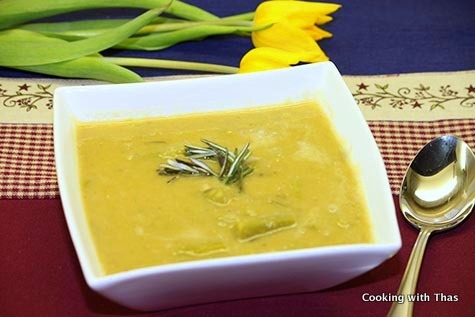 Soups can be made with a variety of ingredients and I do dare mixing up many ingredients while making soups. It’s nutritious, comforting and delicious. Place a large non-stick pan over medium heat, add oil. Let it turn hot. Add dry red chili flakes and rosemary leaves, saute for a few seconds. Do not burn the chili flakes. Add onion, saute till translucent. Add asparagus and red lentil, saute for a minute. Add chicken stock (or 2 chicken bouillon cubes mixed with 3 cups water). Cook covered till asparagus and red lentil turns soft. Take out a few asparagus from the mixture and save them for garnishing. Add the cooked asparagus and red lentil mixture to a blender jar and coarsely puree or use a hand blender. Avoid making into a very smooth paste. Transfer the pureed soup back to the pan. If the soup is too thick, add some chicken stock or water to thin it down. Heat up the soup for 2 minutes. Add ground pepper, if required add salt as well. Combine well. 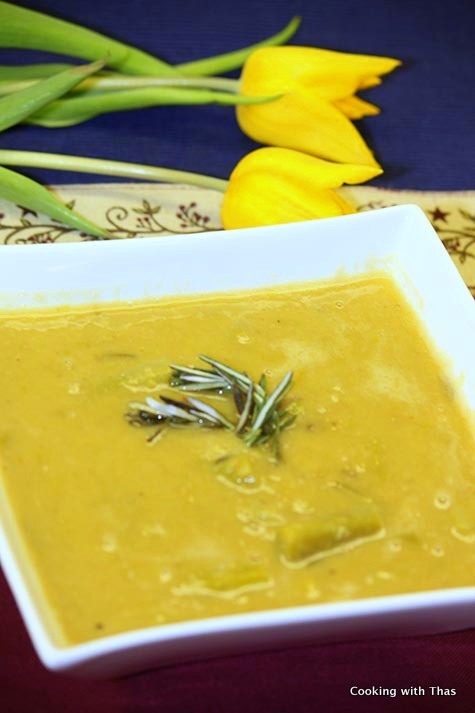 Serve in soup bowls, garnish with asparagus and rosemary leaves. Enjoy with crackers or rolls or bread. To make vegetarian version: add vegetable stock instead of chicken stock.